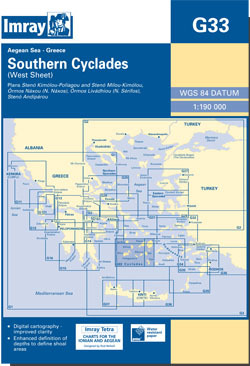 The southern Cyclades islands, western area. Scale: 1 : 190.000. Larger scale plans of Steno Kimolou (Kimolos), Ormos Livadhiou (Paros), Ormos Naxou (Naxos). On this edition, the chart has been fully updated throughout. Depths and positional inaccuracies have been corrected on the Stenón Kimólou-Políagou and Stenón Mílou-Kimólou plan. Extents of the main chart has been adjusted slightly for a better fit on the printed page.